Join Kagan's email list! Get Discounts. Stay connected. See the Power of Kagan! Kagan awards scholarships to 19 educators to Kagan’s 32nd Annual Summer Academy. Great articles, structures, and tips—It's all in the latest issue of Kagan’s Online Magazine. Kagan awards scholarships to 37 educators to annual Winter Academy. Join the Kagan Club for only $19 for an entire year. You receive free goodies, discounts, and access to Kagan’s complete library of articles. Join today! Kagan has been recognized as a Top Workplace in 2018 by The Orange County Register. This is the 6th year in a row Kagan has received this prestigious award. Thank You For the Awesome 2018 Winter Academies. Attention administrators and instructional leaders. Here's a new collection of FREE Kagan articles just for you. Congratulations to Mrs. Andrea Guerra who was just awarded National Teacher of the Year in Belize. Mrs. Guerra attributes much of her teaching success to her use of Kagan Structures with her students. Kagan is featured in Orange County's top newspaper for bringing engagement to the the classroom and workplace. Congratulations to the entire Kagan-UK team for bringing Kagan's full engagement structures to the UK for the past 10 years! Kagan just launched Download Express. Hundreds of engaging Kagan activities and resources are now available for purchase and immediate download. Browse Download Express today! Visit Kagan's newly revised grant section of the web. Offers many funding options as well as helpful tips for securing a grant. Kagan is featured in the Orange County Register as a "Top Work Place" for using the same winning formula to engage students to engage its own employees. Kagan Structures are now available online! Check out Kagan's brand new online professional development platform. 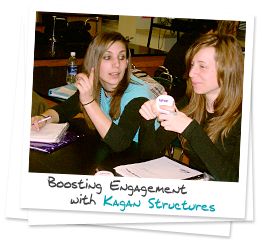 Expert trainers guide you through Kagan's powerful structures to create full engagement in your classroom. Instant support. Anytime. Anyplace. Create engagement—instantly! Kagan just released 3 new software programs to lead you and your class through full engagement Kagan Structures. Structures for engaging pairs, teams, and the entire class. For PC, Mac, and Interactive Whiteboards. Kagan released 4 new apps for Apple devices. Check 'em out on the App Store. Are you a member of the Kagan Club? Receive lots of Kagan goodies, plus unlimited 1-year access to Kagan's online library of articles. Join today! Invest in an approach to teaching that is backed by years of extensive research. Kagan produces dramatic gains for all students and closes the achievement gap.